The title pretty much says it all - I've looked at the docs but I just keep finding Get-Item and Get-ItemTempate. Lets say I have a template with id 123456, I want to get all items that are using this template. How would I do that? Another way using template name and Criteria. There is a report included with SPE called Items with Template that can provide you with this information. This report scans a tree and checks for inheritance at any level. Slow because it has to look at every item. Incomplete because it only looks at the tree specified. I would recommend you use the Get-ItemReferrer command. This is based on the Link Database and should be extremely fast; items that in no way are related are never requested. Be sure the Link Db is up-to-date before running. A similar question was asked here. Example: The following returns all items referring to a given template. As you can see below, all referrers are returned. You can then filter out with Where-Object if you want to exclude content, media, templates, etc. 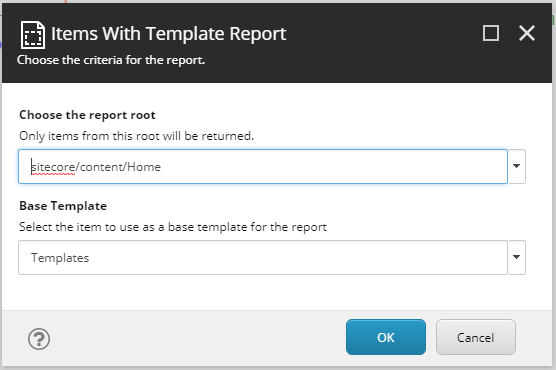 Example: The following returns all items referring to a given template that inherit that template. Demonstrates the use of the trampoline technique to reduce call depth. There are checks to ensure that the item exists and not duplicates are returned. $database = Get-Database -Name "master"
Interesting discovery. Switched from Get-Item to $db.GetItem() and the results are considerably faster; SPE wraps objects returned Get-Item and Get-ChildItem with additional properties. Write-Host "Discovered and returned $($itemCount) items in $($time) seconds"
What is the call depth limit in Sitecore PowerShell and can it be overridden? How to get ALL specific child-items in a folder using fast query? How can I programmatically add a rendering to all of my content items?